12th April 2019. Today was an auspicious day for the team members of Mablethorpe’s National Coastwatch Team. The 50 strong team of volunteers celebrated their 10th anniversary of watching over the beaches of the town, from their Watch station high up on Seaview Carpark. 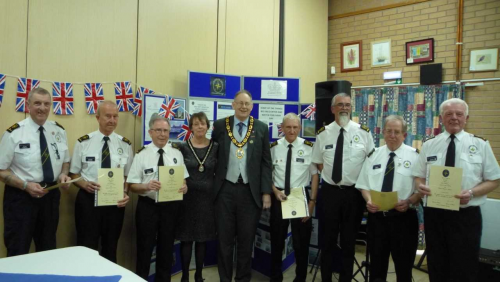 The NCI Mablethorpe QAVS team, are part of the National Coastwatch Institution which is celebrating its 25th Anniversary. Opening their first station at Bass Point in Cornwall in 1994, the charity now boasts 54 stations up to Hornsea on the East Coast and Fleetwood/Rossall Point on the Irish Sea, all funded by voluntary public contributions and at No cost to the Government or Local Authorities. .
L to R: Mr A. Mee, Mr P. Eldridge, Mr A. Abbey, Mrs P. Palmer, Mr S. Palmer, thrMayor and Mayoress of Mablethorpe & Sutton on Sea, Mr T. Richards, Mr R. Druce, NCI Station Manager, Mr J. Warren, and Mr I. Hulse showing a total of 60 years of service to NCI and the Mablethorpe Community.